The USS Constitution is the world’s oldest commissioned naval vessel afloat. 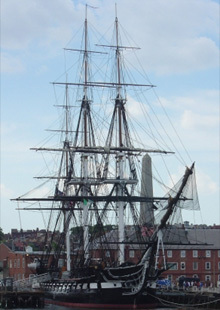 It was named by President George Washington after the Constitution of the United States and one of six frigates authorized for construction under the Naval Act of 1794. She continued to actively serve as the flagship of the Navy following the war, and later served as a training ship during the American Civil War. She retired from active service in 1881 and was designated a museum ship in 1907. Today, the USS Constitution remains a fully commissioned US Navy ship with an active duty crew. The ship and crew participate in ceremonies, special events, and educational programs. 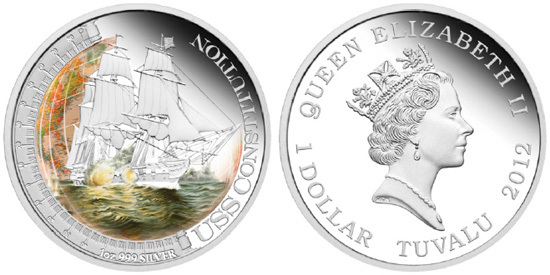 The reverse design of the coin issued by the Perth Mint features a depiction of the USS Constitution in full sail, against a colored globe map in the background. The inscriptions include “USS Constitution” and “1 oz 999 Silver”. The obverse of the coin includes the Raphael Maklouf effigy of Queen Elizabeth II. Each coin is struck form one ounce of 99.9% pure silver in proof quality. A limit of 5,000 pieces has been established for this release. Each coin is housed in a presentation case with a customized shipper and numbered certificate of authenticity. Previous issues of the series have featured the Santa Maria (sold out), Golden Hind, and Mayflower (sold out). The final release of the series will feature the Cutty Sark.